Mood board: Few designers can dress a man in two pairs of pants at once and make an elegant statement (even less in crinkled beige), however Dries Van Noten has a knack for elevating the everyday that has kept his fans coming back for those sartorial twists for decades. This autumn, he revisited a layering of softly classical tailoring and workwear staples (the lounge suit, the peacoat, the bomber) in an inky palette shot through with silver, olive and signal red. Best in show: Although those moiré-striped peacoats and quilted parkas spell instant street success, it's the decadent embroidery across torso and shirt sleeves that was the season's true extravagance. They were inspired by the Miao tribes of Southern China, as was a heavy tarnished choker worn on bare skin. 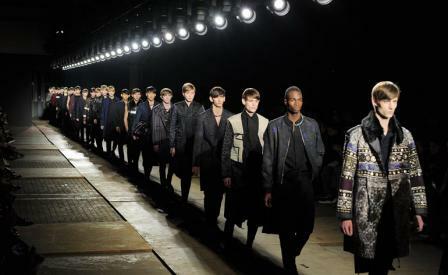 Scene setting: Some of the more utilitarian outerwear looked right at home in Van Noten's cavernous show setting - a concrete warehouse space borrowed from Paris' transport authority - however the sultry, slowed down cover of The Ronettes' 'Be My Baby' ensured he never strayed too far from his romantic laurels.